As I get ready to make another trip around the sun I find myself again reevaluating my beauty care regiment. No not make-up, but more skin care products which I’m hoping to clean up a little more this year and what I put in my body because healthy skin, hair, and nails starts from within. 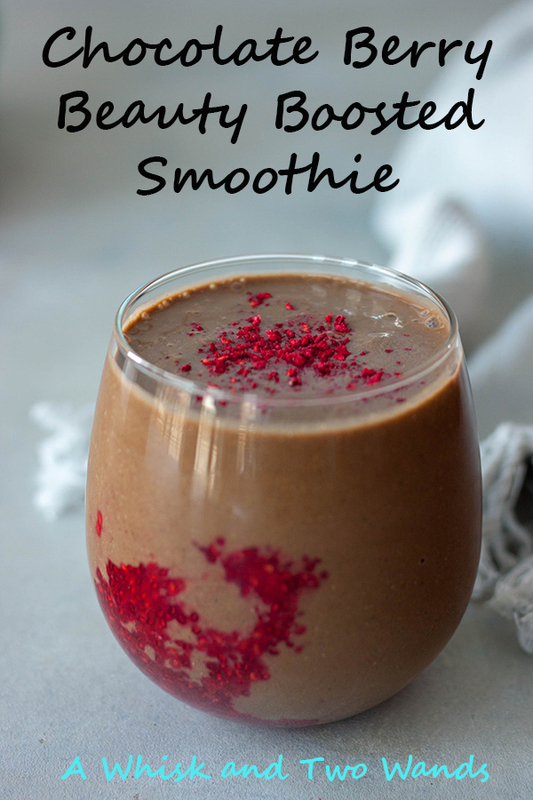 This Chocolate Berry Boosted Smoothie is just one of the ways I get in important nutrients that help. The winter here can get pretty brutal and this year has been exceptionally harsh on the whole families skin. We have humidifiers in the rooms and try to make sure we are not only moisturizing our skin on the outside but also making sure we’re drinking enough skin to keep skin hydrated and it still doesn’t seem to be enough. We drink water like fish! Our nails are strong but with all the hand washing and dry air they’re taking a toll too. Hair well I’m doing everything and more I can in this department, if you have any suggestions I’ll take them, because I wasn’t blessed with the best genes in this area. My hair was very thick growing up but as I’ve gotten older I have very fine thin hair, especially after having children which did a number on it. So how can a smoothie help? What we put in our body reflects our outward appearance. Every ingredient in this smoothie has a purpose. Keep it simple with simple ingredients or you can add in optional ones, I’ve included some of my favorites, like Navitas Organics Daily Beauty Boost and Vital Proteins Collagen. Nuts and seeds are good for your health, not only because they’re packed with good fats, fiber and protein, they can help make skin supple, smooth and younger looking. Essential fatty acids that are in almonds, and nuts in general, are known to help reduce swelling and inflammation. Almonds also pack vitamin E, manganese, and selenium, which help keep your hair shiny. The vitamin E in almonds can also help protect your skin from the sun’s damaging UV rays. Almond oil also happens to be one of my favorite oils to put on my skin. Chia seeds provide a mega boost of omega-3 fatty acids to help promote radiant skin. These essential fats can help strengthen your skin, hair, and nails. Our hair, just like chia, is full of protein, which is necessary to keep it strong and thick. Adding chia seeds, a complete protein, to your diet can help promote luscious locks. Which leads me to protein powder, and I went with a chocolate one because it tastes good and chocolate is also considered a food great for beauty. So if you want go ahead and add in dark chocolate! 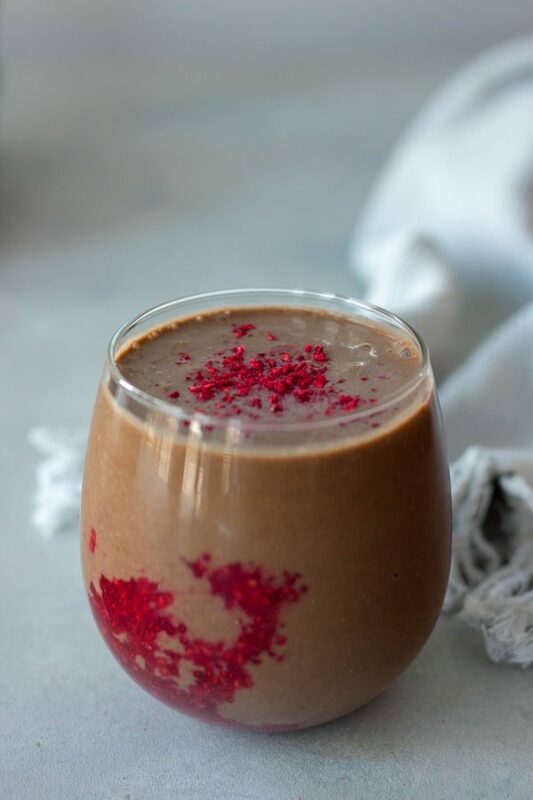 I used Navitas Cacao & Greens Essential Blend in this one that is packed with complete proteins, fiber, digestive enzyme support, antioxidants, and superfoods all in in one. I have another protein staple that I will also note in the notes below, if you have a favorite feel free to use it! Berries are anti-inflammatory and packed with vitamins that help protect you from premature aging. The antioxidants in berries help minimize the damage of free radicals, which can accelerate wrinkles. Vitamin C helps keep skin that’s firm and strong. Also known as ascorbic acid, vitamin C is a nutrient that’s essential to the production of collagen. Packed with simple whole food ingredients this smoothie is already berry delicious and beauty boosted! If you are looking to add more beauty boosting ingredients I like to also add in a scoop of Navitas Organics Organic Daily Beauty Boost. It’s a powerhouse blend of omegas, antioxidants, nutrients, essential vitamins and minerals, and superfoods to support skin, hair, and nail health. Featuring goji berries, maqui, acai, maca, and turmeric. I happen to have all of these but this makes it easy. It’s great for those not wanting to buy all of them. In the notes I will add that berries can be swapped out for acai if you have frozen acai as it’s sold every where now (including Trader Joe’s). Or you can add in any you might have, if you have turmeric and goji berries feel free to just add those. It doesn’t have to be an all or nothing and it’s what you want to do and what you may have on hand. Second is collagen. We have a couple in our house from Vital Proteins and Bulletproof as we just started adding them in for recovery from exercise, aging, and of course all of the benefits. If you want you can do the research on this as there is a lot of it out there but it supports healthy hair, skin, and nails from the inside out. As I said we originally got it for joint and bone health. Aside from all of the healthy beauty benefits this smoothie is great for overall health and best of all it’s DELICIOUS! Really nobody should need to search for an excuse to enjoy chocolate and berries but hey I just gave you a long list should you need it. 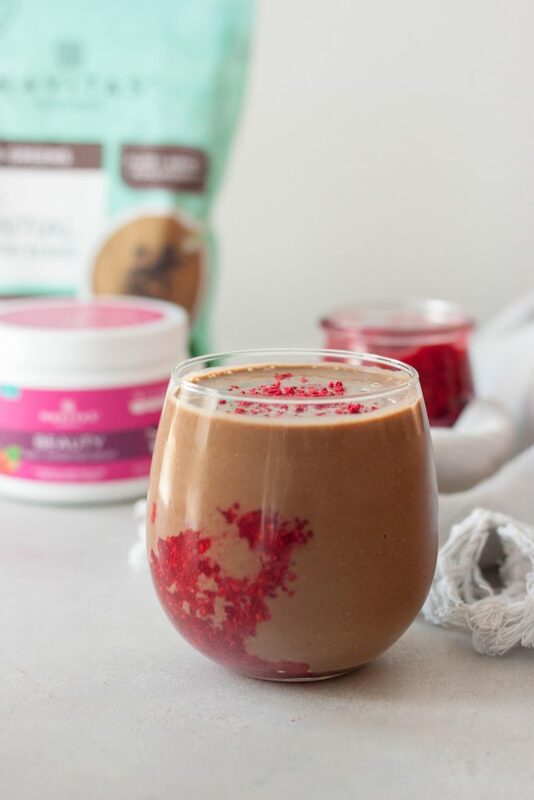 😉 The optional Raspberry Chia Jam is easy to make and great not only in this smoothie but on toast, a sandwich, parfait, oatmeal, or you can even make these Raspberry Joy Bars (an oldie but goodie)! Cheers to finding that fountain of youth, if you find it let me know. If you have any beauty products you love (in any area, skin care, make-up, nutrition) I’d love to hear about them let me know below! 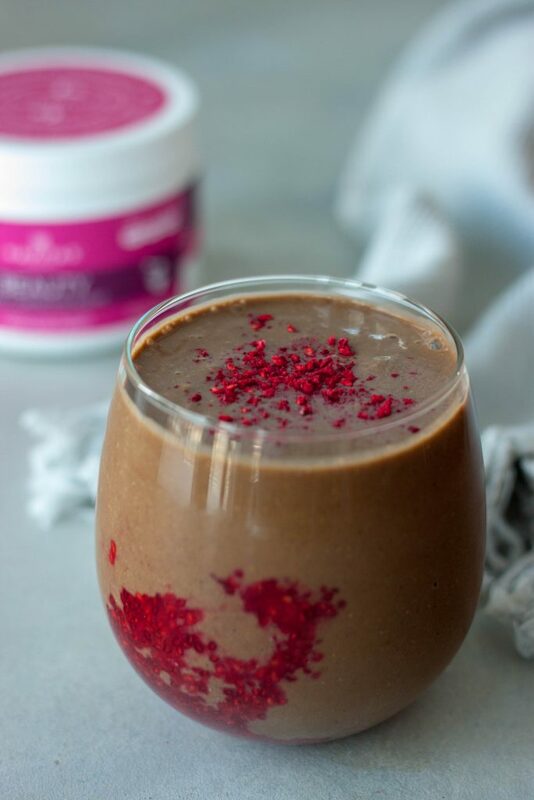 Delicious chocolate berry smoothie packed ingredients to support healthy hair, skin, and nails. This plant-based beauty boosted smoothie not only tastes delicious but supports not only beauty health but overall health. To make optional Raspberry Chia Jam: In a saucepan, over medium/low heat, heat raspberries and lemon juice and bring to just a bubble, mashing with the back of a spoon. Stir in chia seeds and honey and cook for about a minute. Remove from heat, it will thicken as it cools. Store leftovers in the refrigerator. We use this on toast, parfaits, sandwiches, desserts, smoothies, ect. In a Vitamix, or high-speed blender, blend everything except Raspberry Chia Jam and dried crushed raspberry garnish together until smooth. Add a spoonful of Raspberry Chia Jam to your glass if desired, top with smooth and optional crushed dried raspberries for garnish if desired. I think you do! Have you tried them in overnight oats or chia pudding. Otherwise chia jam or smoothies are a good one to start with.